Zebra Pen Corp. and Shoplet.com recently sent me some of their products to review, and I want to thank them for the chance to try out some things I know I'd overlook. 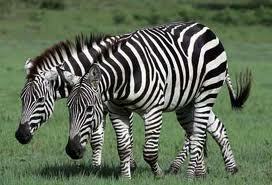 The Zebra Sarasa is one of my favorite gel ink pens, particularly the Eco Clip, and I'm also fond of their G-301 Gel Ink. I've been asked to honestly review the ZmulsionEX Ballpoint and M-301 Mechanical Pencil, so here goes. Update: Just an FYI, there's a Zebra Pen giveaway going on at Shoplet.com right now for the Zmulsion pen (and a chance to win a gift card). You may want to check it out and get one. First, the ZmulstionEX. Well, it is a ballpoint, not a gel ink, so I was worried about the usual ink-smearing problem. But the more I used this pen, the more I got to like the way it felt as I wrote on the paper. The ZmulsionEx features an emulsion ink, a combination of oil, water and pigment, that really was smooth. What seemed strange was that I could almost feel a waxy coating being laid down on the paper, yet when I touched the ink it didn't seem any different than other ballpoints I've used. That emulsion is likely why there wasn't as much smearing on the paper, and drying time was relatively fast. I've used ballpoints where the ink seemed to take forever to dry, and wound up with a lot of stains on my hands. The ZmulsionEX didn't skip or scratch, the ink blobs weren't noticeable, and I like the way this pen feels in my hand. The pen design is, as always, fun. I like the way the blue and orange work on this pen, and the other color choices are just as goo. Also, I was impressed with the very bright orange color of the ink. I don't know what I expected, but this ink looks clean and has a beautiful clarity to it. If you're looking for some ballpoints, give the ZmulsionEX a try. 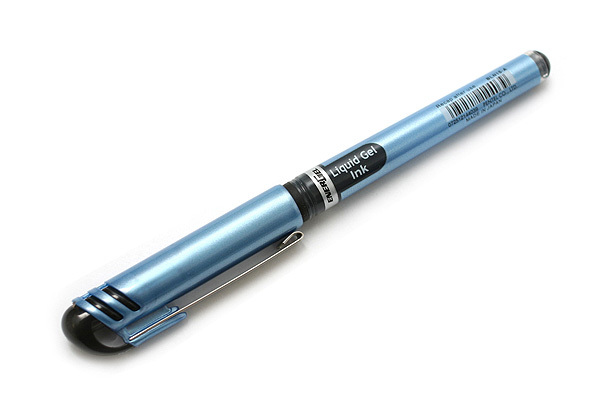 Second in the duet is the M-301 Mechanical Pencil. I'm not a big pencil user, and may not have been the best choice of reviewer for the M-301. There wasn't anything I disliked about it, I just don't use pencils so I can't really say if some feature is good or bad. I like the hard rubber and steel design, and the grip felt good and gave my finger much-needed support, since I tend to press down hard on my writing instruments, leading to a finger ache. After taking the pencil apart I realized the small rubber piece at the end was the eraser, once more proving that my talent for noticing the obvious is, perhaps, truly unequaled. A few quibbles. The lead was a touch too hard for me (it comes with HB lead), but that's easily solved. What I couldn't quite figure out was how to retract the lead, which is one of the touted features of this pencil to prevent breakage. As it is probably on the packaging, which I didn't get, I'll play around a little more and see if I can do it. If you like, and use, mechanical pencils, this may be a good option for you but I honestly can't tell. So if you are a pencil lover and would like to try a Zebra M-301 Mechanical Pencil, leave a comment by Sunday, 7 pm, and I'll do a random drawing and send it on to the winner. A mini-review sometime in the future would be appreciated. 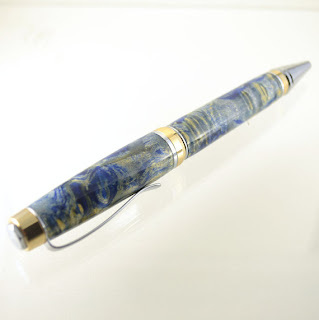 Patrick at The Norsk Woodshop has this beautiful handcrafted Blue Box Elder Burl cigar-style ballpoint pen that he describes as pefect for fans of Monet's waterlilies or Van Gogh's Starry Night. I do think of the latter when I see this, what do you think? Starr Crossed Creations Has Arrived! Just thought I'd share this, my friend Raina has set up her own sparkly-things business, Starr Crossed Creations, and put up a Facebook page showcasing her beaded jewelry work. I've had a lot of compliments on the necklace and bracelet set she made me some time back, and was recently gifted with one of her beautiful Buddhist prayer bead workings (above pic). Hope you'll take a look. A Giveaway at Note Booker, Esq. Note Booker, Esq. is giving away a Rhodia Unlimited pocket notebook. I was truly saddened to read he doesn't care for Rhodia's usual choice of purple ink for their line ruling, but promise to write a letter on his behalf before he's sentenced (it's sedition, NB, not sacrilege). Send him an email, tell your friends about his blog, and enter to win. Many thanks again to JetPens for sending these to me, I love purple and wanted to give them a try. 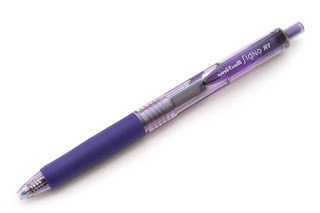 The top pen is a violet purple Uni-ball Noble Metallic gel ink pen, with a slim outline and curved clip. The bottom pen is a lavender purple black Uni-ball Signo RT UM-138. Both pens write well. The Noble Metallic has a 0.8mm tip, which felt and looked too broad for my regular use but would make a great accent pen when I want to note something but don't want to use a highlighter. The color is very metallic, and while the ink starts out dark it dries to a lighter, more sparkly color. If you're looking for dark purple this isn't it, but for color work or accents this is a great choice. Not an everyday-use type of pen for me, but something I'd definitely keep in my lineup when I wanted to add some smiles to my writing. The Signo is more my style, a very deep purple with just a touch of black to it. When I double shaded the Signo it was definitely much darker and richer in color. The 0.38mm tip is perfect for writing, gives a very sharp line that is still broad enough to see the purple-black color but not too broad so my writing goes wonky. Definitely a pen you want to put in your daily arsenal, maybe with the Signo's Bordeaux Black pen as well. Was talking with someone about Sheaffer military clip fountain pens and did a quick search for some more information, when I came across this blog post about military clip pencils from Leadheadpencils. Hadn't thought about a pencil, but of course there would be one. Lots of great posts from a true pencil lover, do stop by. JetPens has some new pen cases from Sun-Star that interested me, pen jackets in two flavors: belt type and magnet type. The one I thought I'd do best with is the belt type, and with a few clicks of the mouse a Wine Red belt type pen jacket was in hand and ready for action. This is a slim case, which appeals to me, and is made of a lightweight, textured nylon fabric. The belt type has a removable, adjustable elastic band that slips over the outside of a journal or notebook, so you can carry your favorite pens and have them at the ready when you need to write. There's also a small loop at the top, so you can the case take off the band and clip it on something. Above I'm testing it on a Rhodia webbie, and like the way it looks. The Pen Jacket doesn't hold a lot of pens, and at first it seemed small--too small to hold my fountain pens. But when I put a few of my thicker pens inside, they fit perfectly and with enough space so the pens weren't rubbing against each other. 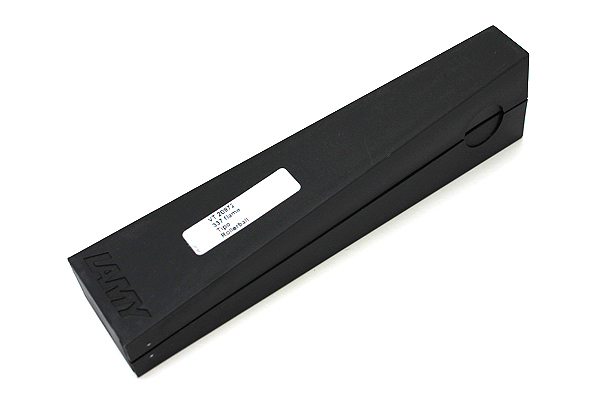 The case measures 5.7 inches by 1.8 inches, and is very lightweight. There's a slide closure loop on the front that was just a little awkward for me, no big deal and likely due to first-time klutziness rather than a problem with the Pen Jacket. The main thing is that the pens are secure and won't fall out, something I've had a problem with on my roll-style cases (surprising to me, as the cases have a flap to put over the pens that keeps them in place). Since my usual daily arsenal includes a fountain pen, I added my Ohto Dude as well as a Uni-ball Signo retractable to the case. Both pens have a pretty wide diameter, but there was no problem. The Pen Jacket is nicely made, the stitching is sturdy without being too tight and pulling on the cloth. I like the black lining they added to the closure flap, and think this is a great addition to my pen case collection. The belt type Sun-Star Pen Jacket will hold regular-sized pens (I'd say something in the Hi-Tec-C range) or two wider pens. Definitely a winner, and the price isn't outrageous. Check out the other colors, and take a look at the Magnet Type if you're looking for a new pen case. Once again, thanks to JetPens for supplying this Lamy Tipo Rollerball for review. It's one of the more interesting designs I've seen, and has 'fun' written all over it. Check out OfficeSupplyGeek's review of the Tipo as well. First, the box (couldn't get a good picture of it, so I'm borrowing one from JetPens). That has to be the coolest packaging I've ever seen, something like a trapezoid shape that flips open and reveals the pen like a single flower in a vase. Very spare and definitely amazing. The pen itself has a big diameter, definitely not your slim Hi-Tec-C or Cavalier. The plastic grip and barrel are sturdy, and feel like they can take some rough handling. The really interesting feature is the clip, which keeps the pen from accidentally staining your pocket. There's a small hole in the side of the pen that catches the clip, so when the tip is extended the clip won't work. Of course, if you're used to just stuffing the pen in your pocket rather than clipping it, this won't work. But for the more precise pen users among us who appreciate and use their clips, this is ideal. I like the medium rollerball cartridge that comes with this pen, but I'm sure you can swap out for a finer point. Great handfeel, four colors to choose from, and not exceptionally expensive in a refillable rollerball. Very simple design for this pen, just a barrel, grip, and the rollerball ink cartridge. There's a spring inside the grip area that doesn't come out, something I'm always worried about losing with my other retractable pens. The Tipo is a great addition to Lamy's pen lineup, and worth a look if you're interested in adding a new rollerball to your collection. Just saw an email from JetPens.com reminding me it's back to school time, and all the choices you have in pens are just a click away. I thought I'd highlight some of the pens that I love, and a few I'm going to review soon. 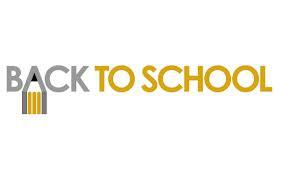 I'll take a look at other school supplies in a second post, definitely including some cool Nomadic pen/pencil cases. Let's start with gel ink pens. Lots of incredible choices, almost too many to choose from but I'll give it a go. One of the basics would be Pilot Hi-Tec-C gel ink pens, which are comfortable, edgy, and quick-drying. Maybe a selection of colors and tip sizes, but definitely start with the little black pen. 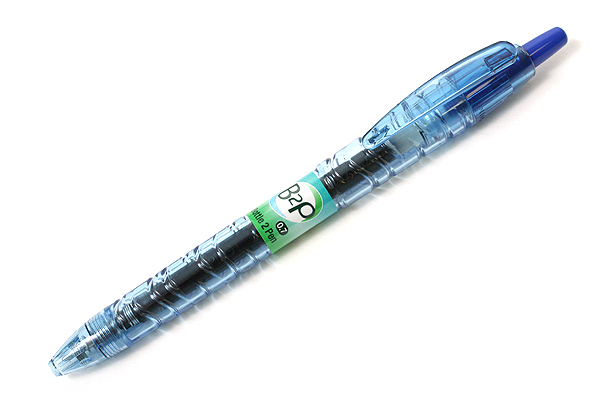 Another favorite of mine is the Pilot B2P Bottle to Pen gel ink pen, a great recycled plastic that really looks like bottled water. The Uni-ball Signo RT UM-138 gel ink pens are a great choice as well, particularly for their Blue Black ink as well as this Lavender Purple Black. Finally, if you have a bit more cash to spend, is the Pilot Hi-Tec-C Cavalier Executive gel ink pen, a needle point tip with a lot of style. Roller ball pens are among my favorites, and I always find something cool and interesting. 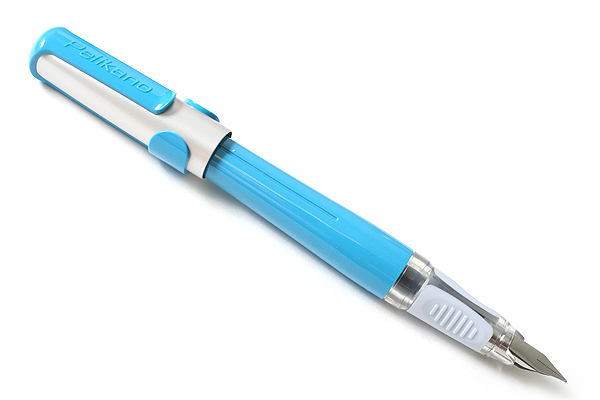 If you want a modestly-priced roller ball, the Pentel EnerGel needle point is your pen. A bit more expensive, but with a very high wow! factor, is this Lamy Tipo roller ball, one of the best pens I've ever used (review coming soon). Naturally I have the orange and black one. If you're a fountain pen type, there are some nice options that aren't all going to leave your wallet weeping. 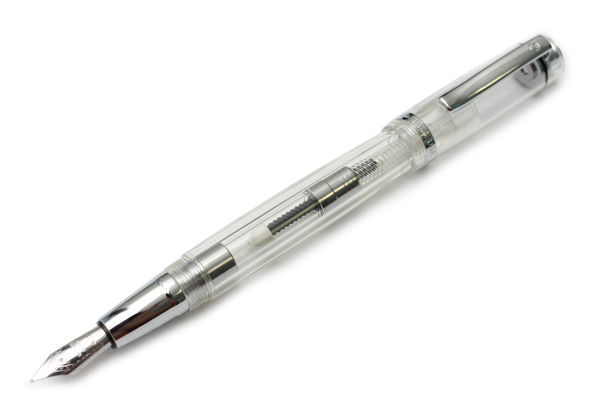 Top of my list would be this Sailor Clear Candy fountain pen, which I reviewed and liked a lot. Ditto the Ohto Dude fountain pen, elegant but removing the cap does take some strength. Pelikan's P480F Pelicano has an interesting design and color choices, which I like. Definitely a good, sturdy pen which I'm hoping to review soon. 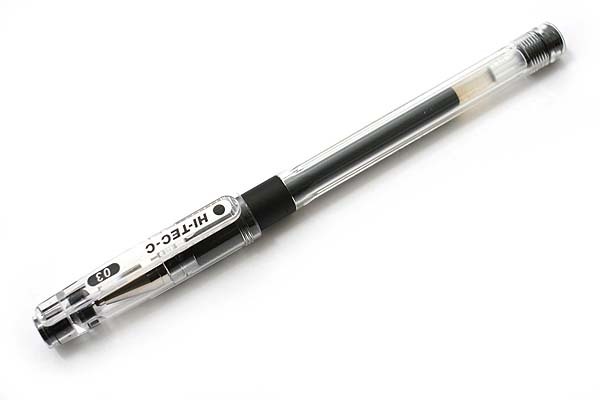 I wrote about this Monteverde Artista clear demonstrator a year ago and heard from a few readers who bought it (seems you can change out the nib and put in a Noodler's flex), so I'm thrilled to see it at JetPens, and love the clear color choices. It also comes in a roller ball version, if you want the beautiful style in an easier writing format. Finally, this Parker Vector has intrigued me for some time. I've used the Vector roller balls and liked their spare design, the fountain pen looks equally good. It's here! I am planning to offer some free download days, I just have to figure out when and I'll announce them. 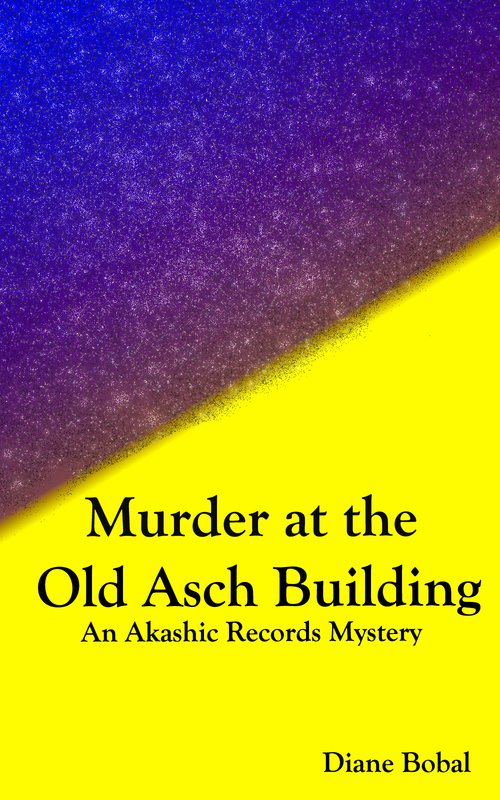 Whatever else, I finally wrote it. If you don't have a Kindle, there are apps available so you can read on your PC/Mac, iPhone, iPad, and other devices.